Whilst deep into summer, your side game better be on point. Because let's be real, side dishes are the stars of the menu during these months. This recipe came together in minutes just based on what I had on hand to go with some grilled chicken. 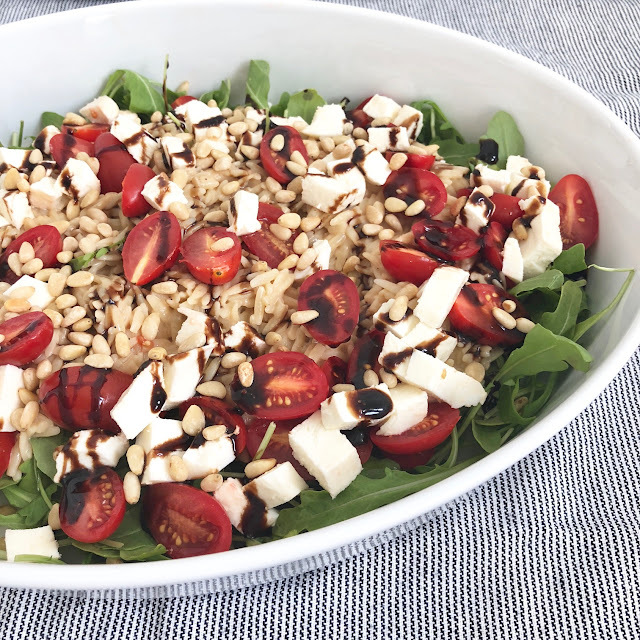 It was a way to highlight sweet summer tomatoes and peppery arugula that rounds out the dish. It would be perfect to bring to a party and can be made in advance to savor later. You can also easily make more or less based on how many mouths you are feeding. There is nothing fancy here, but it surely will look like you slayed it at home or amongst friends. Get out a large platter or shallow bowl and place the arugula in the bottom. Spoon the orzo over the arugula leaving a border along the sides. Then sprinkle the tomatoes, mozzarella, and pine nuts on top. Lastly, drizzle with the balsamic glaze and season with some fresh ground pepper and salt. *You can make this an hour or two ahead of time and refrigerate. Skip the salt and pepper at the end and wait until before you serve to add it.